The holiday season is supposed to be merry, bright, and full of cheer for everyone involved. However, if you are suffering from a hearing loss condition, it might not be so fun. The holiday season is supposed to be merry, bright, and full of cheer for everyone involved. However, if you are suffering from a hearing loss condition, it might not be so fun. When you have issues with your hearing, it can lead to uncomfortable gaps in the conversation, and the frustration of having to speak louder or repeat what you just said. 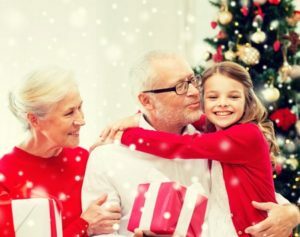 Here are some pointers on how to temporarily overcome hearing loss during the holidays. Even in normal conversation, context is important. For those struggling with hearing loss, no matter how profound, providing context is even more helpful. Context can help both those with hearing loss and those without it. If the person you are talking to is the one with hearing loss, rephrasing will give them a moment to process what you said. They can then decide how to respond appropriately. Also keep in mind how softer sounds such as p, s, and sh are more difficult to differentiate, especially in a crowded room or around a packed table. Again, this tip is helpful advice for both parties, whether or not they have hearing loss. When you know who you are trying to talk to, use their name before continuing. This tactic should gain their attention so they understand they should pay full attention to you. When you face the speaker, not only can you hear what they are saying more clearly, but you can also pick up on vital visual movements such as gestures, even if aural clues such as inflection are harder to detect. Inclusion in a conversation or activity is always crucial for avoiding hurt feelings and unwarranted anger or sadness. We have one last piece of advice: stay away from any possible sources of background noise. Even though it might be tempting to sneak a snack, appetizer, or dessert, going into the kitchen might not be the best idea, especially if it is right before dinner is served or immediately after it is has finished. Find polite ways to reduce other noises, such as turning down the TV or music. By turning down the volume, you can make it easier for everyone to participate in a quiet chat. And if you are the one with hearing loss or some other type of hearing condition, it might make it easier on your sanity to stand in a spot where you can see and hear everything in a room full of your relatives. This entry was posted on Friday, December 15th, 2017 at 12:25 pm. Both comments and pings are currently closed.